Put the uncooked hominy and the broth into a pressure cooker. Cook under pressure for 45 minutes. After the 45 minutes, turn the heat off and let the pressure go down on its own. (If you don't have time to do that, cook a little longer.) When the pressure has gone down, check to be sure hominy is done. It should be fully "bloomed" and tender but still a little chewy. Pressure cook a little longer if necessary. While the hominy is cooking, saute the onions and garlic in some of the oil. Cut the pork into bite size pieces. After the hominy is done, mix in all the other ingredients. Add more broth or water if you'd like it to be a little soupier. Optional: Serve with sour cream and/or cheese and fresh lime wedges. Can used plain canned hominy instead of cooking your own. We used chicken broth because that is what we had. 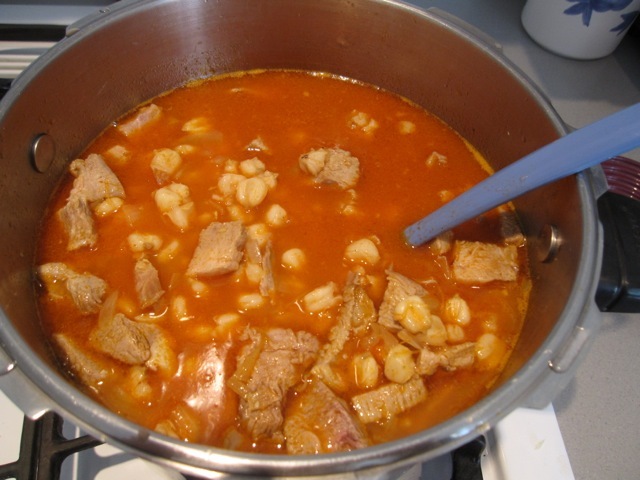 If you don't want to use a pressure cooker, see Casa Chimayo's Posole for how to cook the hominy without a pressure cooker. You can cook the pork along with the hominy as described in above Casa Chimayo recipe. We have been using Santa Fe Olé Red Chile Sauce. Probably any kind of traditional New Mexico red chile sauce will do. Or, you can make your own chile sauce as described in the above Casa Chimayo recipe.